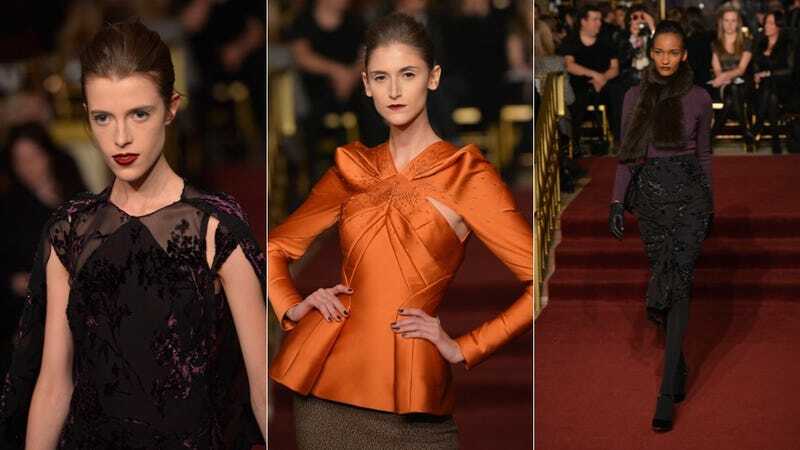 There was no mistaking that Zac Posen's collection presented yesterday during NewYork Fashion week was a fall collection, as the hues were aggressively autumnal. Deep, dark, rich colors like pumpkin, loden, eggplant, bordeaux, chocolate. Nothing light and breezy here — even the lips were wine-colored — and the fabrics were weighty, often folded, draped, pleated. It all felt a little too heavy for me, but if you're into beautiful, dramatic gowns and sumptuous velvet skirts, you may see something you like. If you live in a drafty château on the edge of a vineyard, you may see something you need.